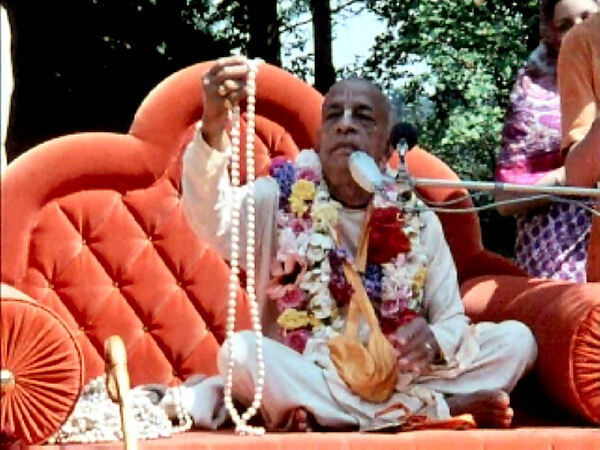 I can see myself here getting my initiation beads, and this is I think the best moment of my whole life – to actually get my beads from Srila Prabhupada and to feel like this connection was made. I think I cried the whole way through the ceremony. I remember when my neck beads were put on, Krishna Bhamani put my neck beads on. She is saying to me, “You can’t cry in front of the Deities,” and just looking at Srila Prabhupada and this moment of actually getting initiated was so overwhelming that I just couldn’t stop the tears. I remember looking at Prabhupada’s eyes. It looked like Srila Prabhupada had tears in his eyes. His eyes were wet, they were floating with this water.